Develop Profile by BEST Inc. 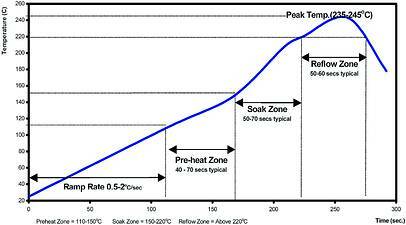 Thermal profiling is required for several operations in the reflow process including device removal and reflow. Each specific BGA site to be reworked must have a BGA rework profile developed individually profiled as each site has variations which affect the reflow process including the location of adjacent components and heat-sinking variations of the PCB internal layers. By creating a BGA rework profile for each location the risk of over or under heat exposure to components, lifted pads, damaged solder mask as well as improperly soldered joints is minimized. There are several methods available to correctly identify and build a PCBGA rework profile. The method used is a function of the availability of a sample or test profile PCB and component to be reworked. One method assumes that a profile PCB and part is available in order to establish the BGA rework profile, while another assumes that no dedicated profile PCB exists. Whatever the method used it is critical to read amongst other temperatures the BGA solder joint temperature. Floating air thermocouples or thermocouples attached next to the part being reworked are NOT accurate solder temperature indicators rather a temperature probe installed inside a solder ball to be reflowed is the proper location. A thermocouple embedded in to the solder ball is the preferred profiling method as it provides the most accurate BGA older joint temperature readings, serves to reduce the chances for damage to nearby components on the boards being reworked, while reducing the chances for board damage or warpage. In this method the thermocouple is attached to the solder ball either on the side of the BGA ball using conductive epoxy or into the BGA joint by drilling through the backside of the BGA and filling it with thermally conductive epoxy. The thermocouple is then properly routed between the balls or on the underside of the PCB. In this method it is critical to measure the temperature under the center of the BGA to be reworked. Insulated thermocouples are pushed underneath the center of the BGA to approximate joint temperatures in order to formulate the best BGA rework profile. It has been shown that thermocouple readings are affected by hot air nozzles of rework stations if they are placed near the outside rows of the of the solder joints. Thus the center BGA solder joints, which tend to be lower in temperature than the outside rows, need to be measured. In this technique the BGA rework profile is established during the removal process.